Oranges are a winter citrus fruit, grown on the coasts of the Mediterranean and in the warm regions of the world. 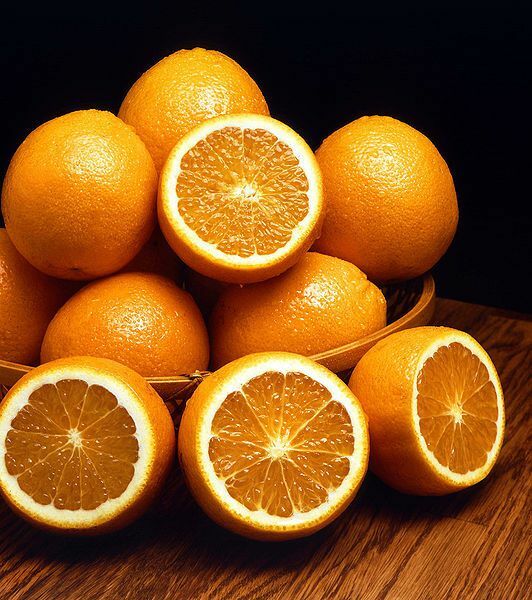 The orange is a well-known source of vitamin C (53 milligrams per 100 grammes). It is less well known as a source of calcium (40 milligrams per 100 grammes), potassium, B vitamins and fibre. late oranges (late winter) have few seeds and light-coloured flesh. Oranges can be stored for about a week at room temperature, or a little longer if kept in the crisper. Choose heavy and preferably untreated oranges if you want to use the zest.